Sue Dickey Susanna Amanda Heino was born to Finnish immigrants, John and Senia Heino on August 11, 1925 in Meadowbrook, Ore.
She grew up with three sisters and one brother and lots of relatives and friends in the Scandinavian community in the area. Sue graduated from Molalla High School and later married James Blair Dickey in 1948, after he came home from World War II. They worked together as a team on the Dickey family farm until Blair’s death in 1982. She also worked for many years at the Bird’s Eye frozen food plant in Woodburn, Ore.
Blair and Sue had two sons, David and Leslie, who grew up in an idyllic childhood on the farm. In 2000, Sue married Ivor Davies and they enjoyed some great times together until his death in 2005. She will be remembered by all for her cheerful nature and helpful ways. Sue is survived by her two sons, David (Kathie) and Leslie (Karen); grandchildren Blair, Brian, Jeffrey, and Aaron Dickey, Heather Kuykendall, Amber Fink, Ashley Ohlwiler, and Yvonne, Molly, Stephen and Andrew Kimball; great grandchildren, Tyler and Elliot Kuykendall, Nicholas, Ojeda, Tara, Tiffany, Cy and Chase Ohlwiler, Annika and Thomas Kimball, and Jack Fink. She is also survived by her sister, Si Matson. Sue was preceded in death by her brother, Bernhard Heino, who died at childbirth, her brother Edward “Hezzie” Heino; and sisters, Esther Watson and Ethel Jackson. Memorial contributions may be made to Adams Cemetery, Molalla Historical Society, or Molalla Grace Lutheran Church. Services will be held Thursday, Oct. 22 at 1 P.M. at the Molalla Methodist Church. Pastor Eric Bohlmann of Molalla Grace Lutheran Church will officiate. 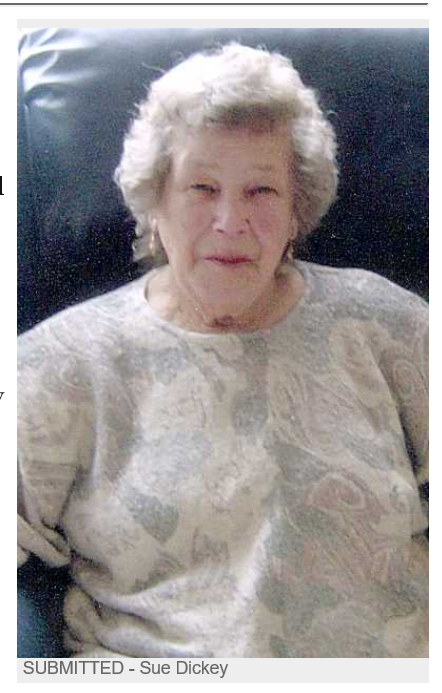 Sue Amanda Dickey, 90, passed away in Molalla, Oregon on October 11, 2015. She was born in Meadowbrook, Oregon on August 11, 1925 to John and Senia Heino.